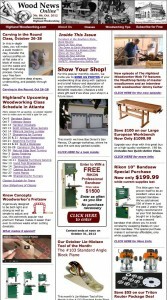 The newest issue of Wood News is out and ready for you to read! We’ve got a lot of great stuff for you to read this month, starting with a very entertaining Down to Earth Woodworking column about the beards of Woodworking, where Steve Johnson manages to equate the increase of facial hair in high fashion to a resurgence in the popularity of Woodworking. Read that plus his review of the Kreg Shelf Pin Drilling Jig as well as a commentary on Perfection in Woodworking in this month’s Down to Earth Woodworker. Bas Dinant’s great garage shop is featured in this month’s Show Us Your Shop, along with beautiful carvings by Brander Roulett in the Show Us Your Carving column and some impressive woodworking by Michael Fritz in the Show Us Your Stuff column. Jeffrey Fleisher provides a primer for using a tracecoat while sanding, and J. Norman Reid reviews ‘Furniture in the Southern Style’ by Lang & Huey. All this plus a new downloadable project plan, a new Lie-Nielsen Tool of the Month, and so much more. Check it out now!